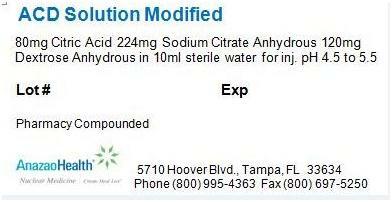 ACD solution modified is to be used in the labeling of red blood cells for intravenous administration with Cr-51 Sodium Chromate. Labeling may be performed without washing or centrifugation steps directly in the reaction vial. A 30 to 50 mL sample of whole blood is withdrawn from the patient and added aseptically to a vial of ACD Solution Modified. depend on the intended use of the labeled red blood cells. The suspension is incubated for 30 to 60 minutes at room temperature with frequent, gentle agitation. After incubation, 100 mg Ascorbic Acid Injection is injected into the vial. The ascorbic acid reduces any remaining unbound dianionic chromium 51 to the anionic state which does not penetrate red blood cells; thus in vivo labeling of red blood cells is prevented.